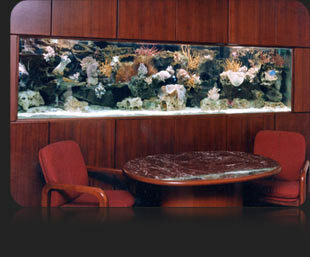 Aquariums require a filter system which is the lifeblood of the aquarium, maintaining pristine water quality and healthy fish. Aquarium filters accomplish this for us through 3 different processes. Mechanical filtration is accomplished through the removal of particles from the water. Water passes through a medium, such as floss, a filter pad or micron sock working like a sieve that selectively traps particulates. This can help keep the water from being cloudy or silty. A chemical filter is a medium that works through absorption, whereby chemical compounds are removed from the water. There are many chemical filters that can be used to clean water, but carbon and Poly Filters are the most common. Carbon is a substance that has many pockets and bonding sites on it, so that impurities, colors, and odors can attach to it. There is a finite amount of these bonding sites, so eventually the carbon must be replaced. It is important to note that while carbon can help “clean” a tank from byproducts and pollution, it is not a suitable replacement for biological filtration. Poly Filters are mechanical filter pads that are impregnated with ion exchange resin much like the filters used in kidney dialysis machines. Poly Filters are highly effective at removing organic waste from the water. These also need to be routinely replaced. This type of filtration is by far the most important for keeping fish in an aquarium. From the moment fish are introduced into the aquarium, they begin releasing ammonia, their principle waste by product. If allowed to build, this ammonia can kill fish by burning the gill tissues and preventing them from taking in oxygen. Beneficial bacteria help us filter the water through a biological oxidation process. Essentially, waste laden water passes over bacteria, which consume the waste and convert it into less toxic compounds. This process is called the “Nitrogen Cycle” and it is a LIVE filter. Power and canister filters push or pull water through a set of media in a container with a motorized pump. Water is pulled into the unit through an uptake tube and passes through various media before being expelled to the aquarium again. Hang on the back power filters are small and inexpensive. 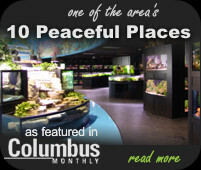 Canister filters are sealed, pressurized and reside beneath the aquarium, inside the aquarium stand. Additionally, the powerful water movement allows these filters to be used on large tanks. With quick disconnecting hoses, it is easy to perform maintenance by taking the filter to the sink, so that water is not spilled. Trickle filters (usually a rectangular glass or acrylic box) are an evolution of standard filters being more efficient in less space. The basis on which they function is by housing biological media in a filter chamber and as water is dripped or sprayed over it, large amounts of beneficial bacteria grow. Due to the high contact of air to the wet media, the bacteria grow in a wet-dry, highly oxygenated state. Most trickle filters employ a filter fiber as a pre-filter to do most of the mechanical filtration. Bio-balls, DLS material, bio-stars, and more are the media used for biological filtration. Trickle filters are large, so like canister filters they are typically located underneath the tank, inside the aquarium stand. 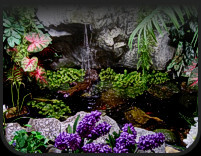 Water from the aquarium is allowed to “overflow” down a standpipe inside the aquarium to the trickle filter and then is returned to the aquarium by means of a water pump. 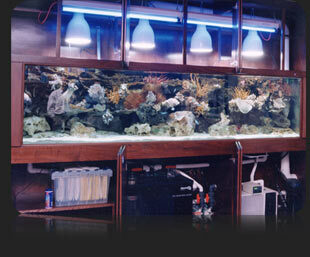 Protein skimmers are perhaps one of the most influential developments in keeping saltwater aquariums. They have made it possible to maintain very high levels of water quality for extended periods of time. Protein skimming may also be known as foam fractionation, and the concept behind it has been in use for decades. Protein skimmers function in a deceptively simple manner. Foam is created by mixing saltwater and air together—the finer the mix and the smaller the bubbles, the more efficient the skimmer will work. Proteins and other organic molecules stick to the bubbles, which creates a stable foam that rises above the mixing air and water. This foam is then collected before it is returned to the tank. The wastes, organics, and proteins that are collected are pulled out before they have a chance to break down. This effectively scrubs the water clean, removing all manner of waste materials from the aquarium and making the biological filter more efficient. Ultraviolet sterilizers work by passing water through a sealed tube with an ultraviolet light; the light emits rays that sterilize or alter the DNA of living organisms that pass by it. Because this is fed by a pump with a pre filter, large animals (like fish, etc.) are not harmed. Bacteria, protozoan, algae cells and parasites are all killed with this method. The key to using one of these is to size it correctly to the tank. UV sterilizers are generally connected “in line” between the aquarium and the filter system. The U.V light bulb is effective for about 6 months and then needs to be replaced.